Paris was attacked on Friday and the police had to step up and enter the line of fire. In order to do that they had to make sure they were protected. This was the shield they used as they stormed the Eagles of Death Metal concert in Paris. And they carry BLUE guns?? Every terrorist deserves to die! They would be training firearms. 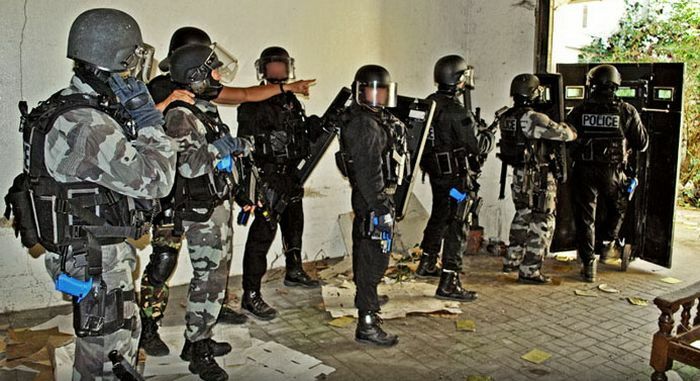 I don't think they are French in the photograph, as they have Police on their backs, not gendarmerie. The gendarmerie and police are two distinct thing. This is the same word in english and in french.